Last minute costume alert: Casual knit princess-inspired dresses and tunics - Peek-a-Boo Pages - Patterns, Fabric & More! I have a confession. I don’t really love Halloween, and I don’t love making costumes, either. So much work for so little wear. And they always turn out to be more work than expected, too – or at least they do for me! (They’re not quite as bad as hemming pants or making throw pillows, but close.) Bah humbug, I know. I’ve started with these 4, but the sky’s the limit, really. 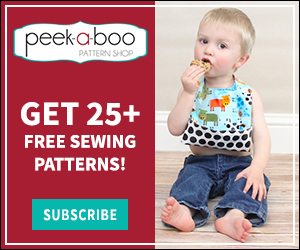 All you need is a comfy, well-fitting knit bodice pattern, your child’s measurements, knit fabric, and some embellishments. All of these dresses begin with the same basic top pattern (I used the Peekaboo Patterns Rosalie ruffle tee as the base for mine, just minus the ruffles. 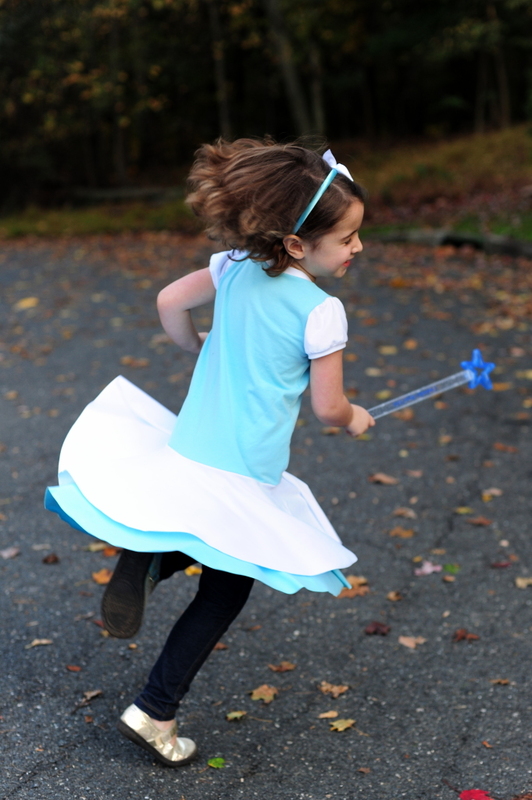 It’s got a nice slim fit and a cute puff sleeve – and a size range of 3m-12y – so it was perfect for these princesses). 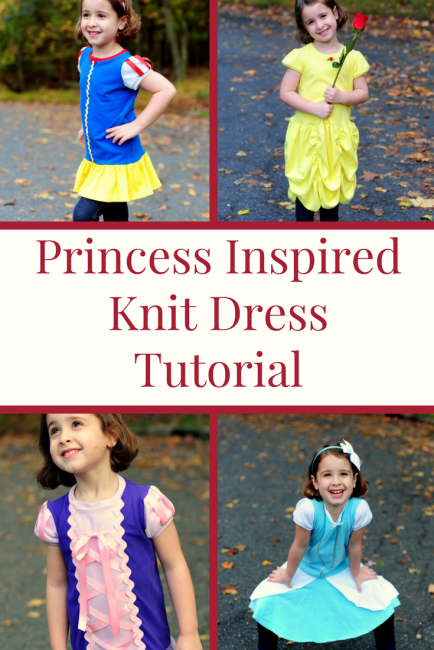 These were pretty inexpensive to sew, and the solid color knits can be found in a variety of places. 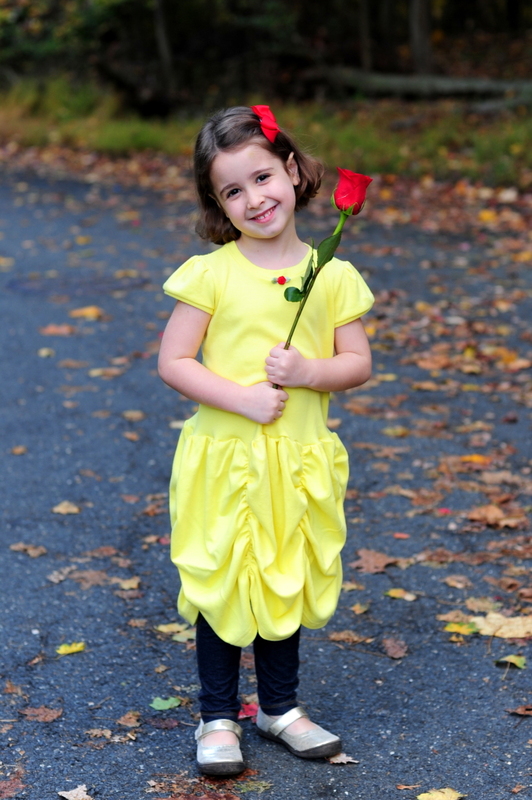 I used a cotton interlock for “Belle” and it was a bit heavier than I might have preferred, which affected the drape. But the color was spot on and the knit was super soft, so we made it work. The other princesses are made from cotton lycra knits – I like the Laguna jersey knits from Robert Kaufman, which can be found on fabric.com and Hawthorne Threads, among other places online. I also like the cotton lycra knits that the Purple Seamstress keeps in stock. If you send Mel a message, she’ll mail a free fabric swatch chart to you with all of the colors of the solid knits that she has. Her customer service is amazing as well! 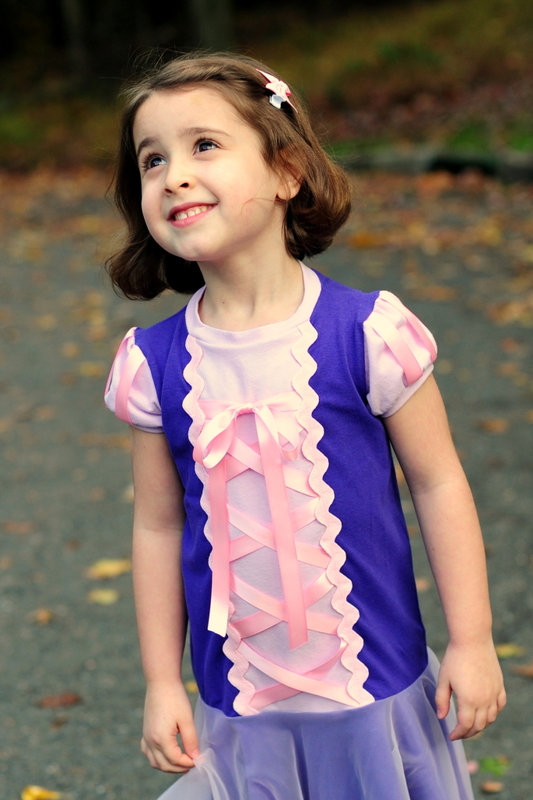 You can also look for upcycles to use for nice colors – the lavender that I used for my “Rapunzel” tunic is from a womens 3xl cotton lycra top that I picked up on clearance at Kmart. 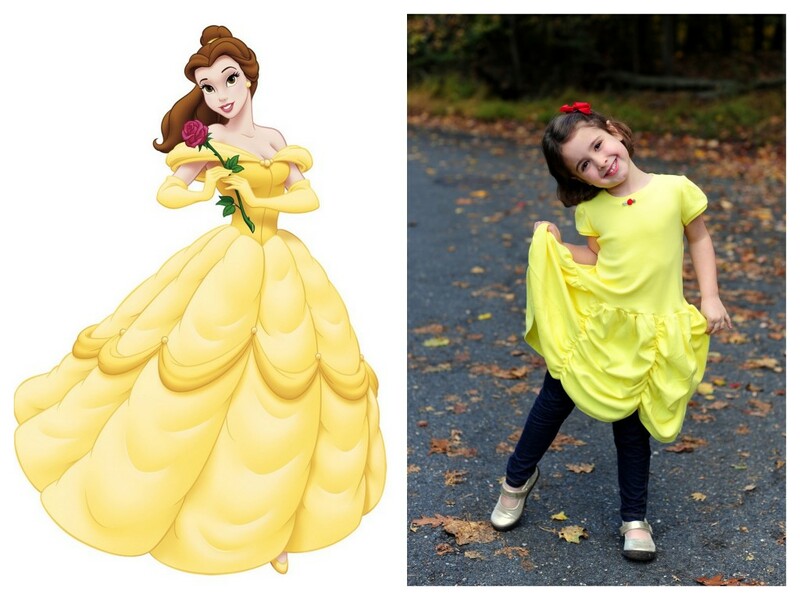 It is really the colors and details that distinguish one princess from the next. Belle has her gathered pickup skirt, Cinderella has the white poufy peplum-ish things on her skirt, Snow White has the bold primary colors, and Rapunzel can be quickly identified by the lace-up corset on the bodice of her dress. A quick image search of the princess you’d like to use for inspiration will give you both a variety of ideas (there’s no *one* perfect look for each princess, as you’ll quickly note) and also the key features for each. When I made this dress, I attached the gathered (and already hemmed) skirt to the bodice and then added the elastic last. 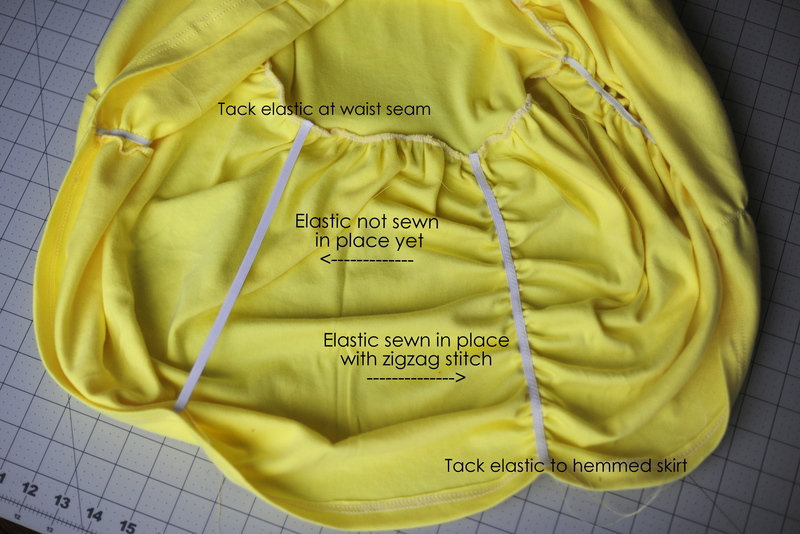 You can add the elastic to the skirt pieces and then attach them to the bodice after (as Amy did) if you prefer. Doing it that way will also allow you to further shorten the bodice if you need – the skirt does have a bit of weight to it from all of the gathers and the pickups. My daughter was excited to find that it was still super twirly, though! When it came to the skirts for these dresses, I wanted to mix it up a bit so I did gathered skirts for two of them and circle skirts for the others. 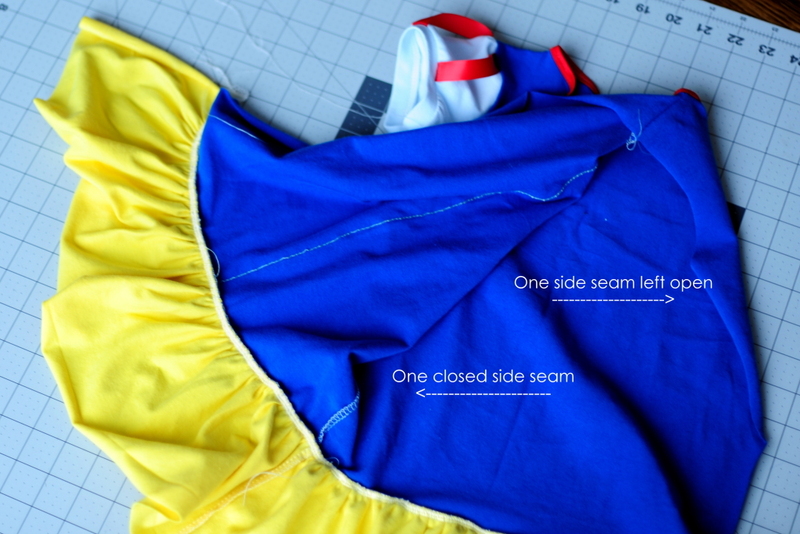 For my Snow White-inspired tunic I did a short gathered skirt which looked sweet. For that one, I closed one side seam and then gathered and attached the skirt flat before closing the second side seam. Doing it that way allowed me to make sure my gathers were nice and even. I love the way this one turned out. 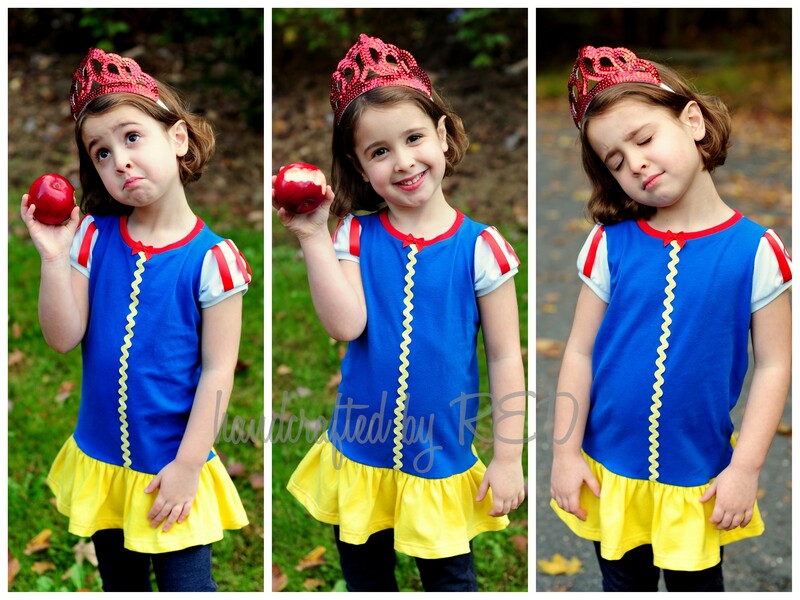 Snow White may not be as popular as some of the newer royalty (ahem, Queen Elsa), but her look is timeless and the colors are bright and fun. 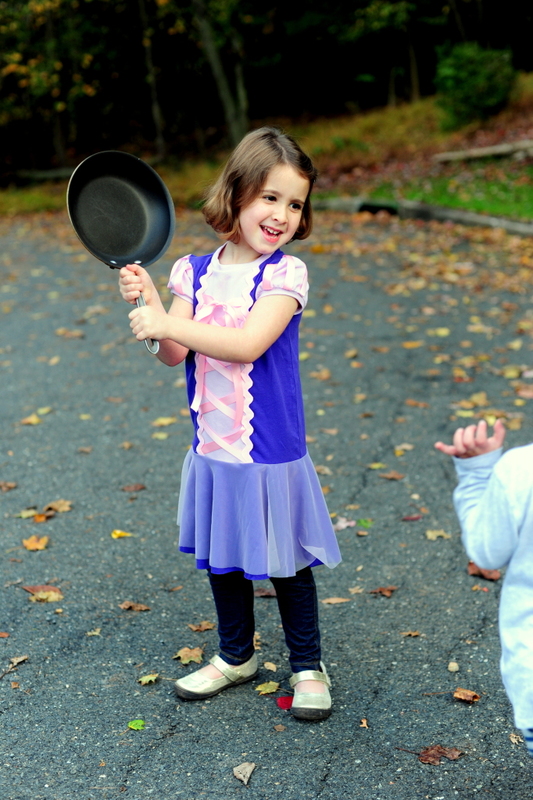 I’m pretty sure Snow White didn’t wear jeggings from Target under her dress, but our version is a bit more practical for preschool. 🙂 Miss P really played this one up – and it was fun to watch her act out something other than turning us all to ice. 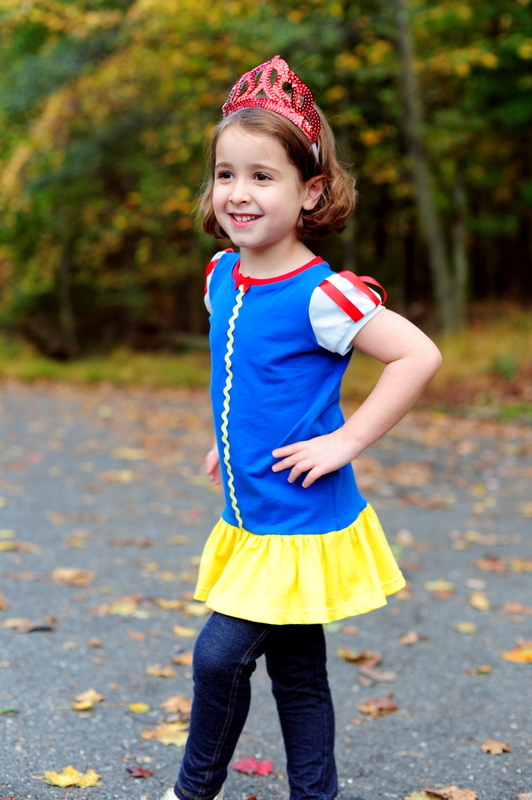 There are many variations on Snow White’s dress (and for comfort I left off the big white collar), but one thing that you’ll see pretty consistently is the striped puff sleeve. 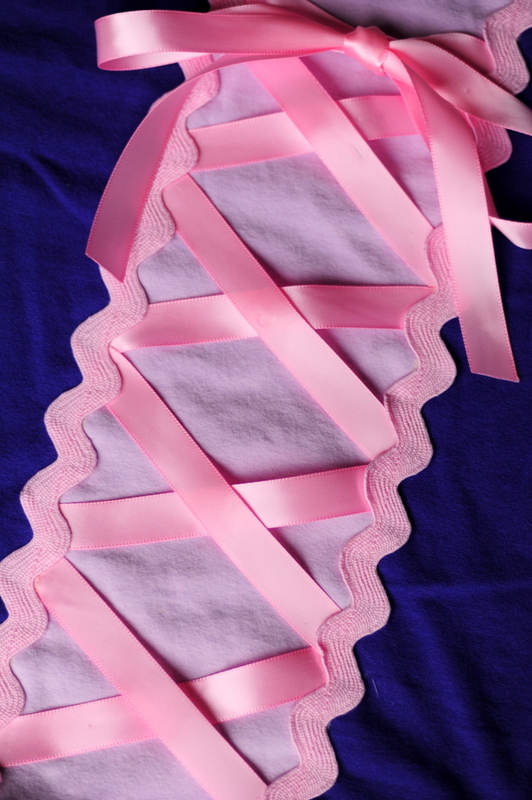 Rapunzel has a similar one in the movie Tangled, and they’re very easy to do using satin or grosgain ribbon. The binding at the bottom of this particular sleeve makes it even easier, since the ribbons get sewn into that seam. I started by cutting out my sleeve pieces, and cutting strips of ribbon to lay vertically on the sleeve. (You can also use fabric paint to apply stripes to your sleeve pieces before attaching them to the bodice, but I like the way the ribbons stand out from the sleeve a bit. They’re sewn in place at the shoulder seam and the band at the bottom, though, so they stay in place nicely.) For these sleeves, I used 3 ribbons per sleeve, but you could always do 4 or five if you want the stripes to extend all the way around the sleeve. I baste the ribbons in place at the tops of the sleeves, and attach the bands to the bottom. You can baste the ribbons to the bottom of the sleeve before attaching the band if you’d like, but I found that just having them pinned at the center and holding them down as I serged the band was sufficient and they didn’t slip out of place. 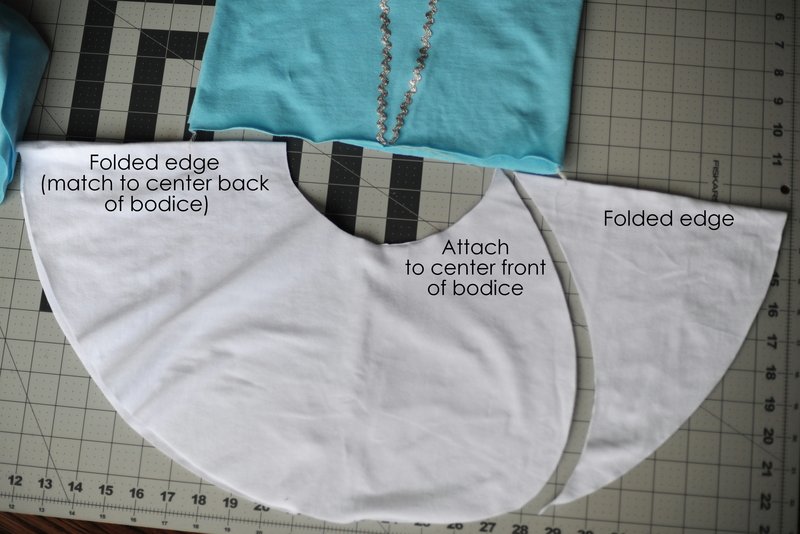 Then you’ll gather the top of the sleeve slightly and attach to the bodice per the pattern instructions. There ya go – easily embellished puff sleeves! 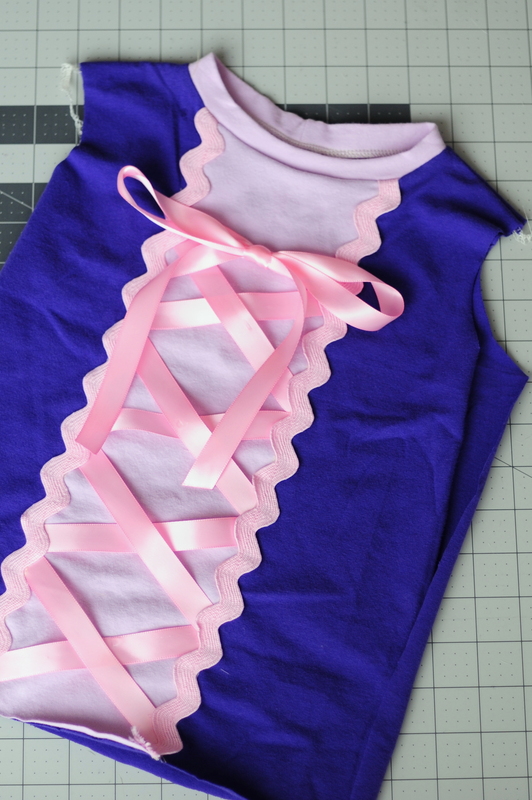 The sleeves are only the beginning for our Rapunzel-inspired ensemble – that gal really knew how to embellish! For this one my advice would be to add the embellishments to the bodice in layers – I didn’t think a full corset was necessary and probably would have negated the comfort factor 😉 so I just cut out a full bodice (the darker purple) and layered a faux bodice on top. 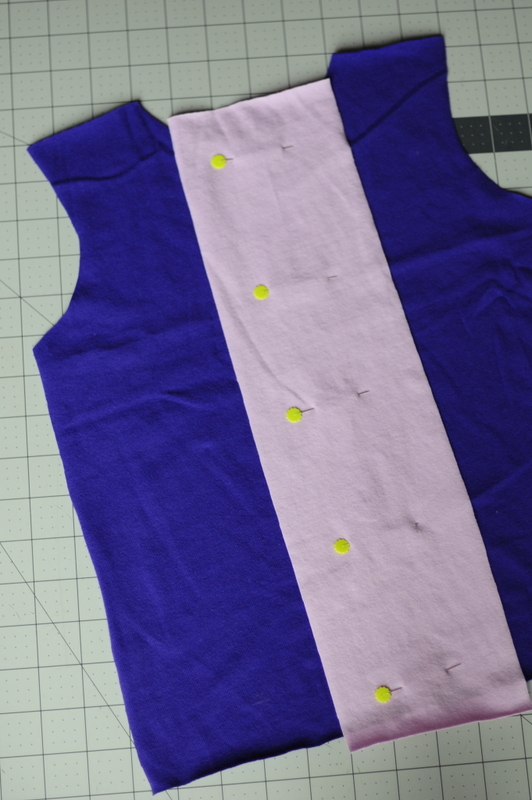 I started with a 4-inch wide strip of lavender cotton/lycra, and sewed it down along the sides (the long edges). I just used a long straight stitch for this (about 4mm) since the rest of the bodice has so much stretch. I didn’t think the straight stitch would be a problem (and doesn’t appear to be, this dress goes on and off super easily). Next I laid the ribbons down for the “lace-up” effect. 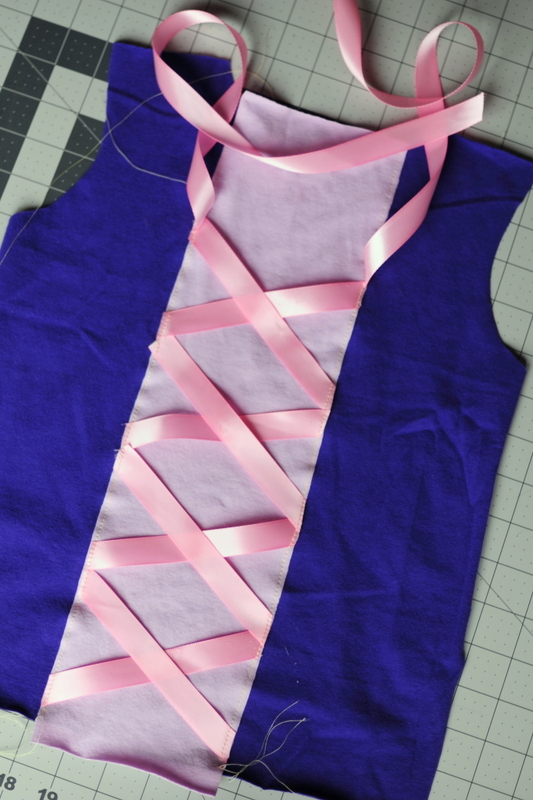 I put down strips of ribbons in an “x” shape along the length of the bodice, with two long strips at the top for ties. I basted them in place along the long sides of the center panel, and left the center parts (where the ribbons cross) loose. You could certainly tack them down if you’d like, too. 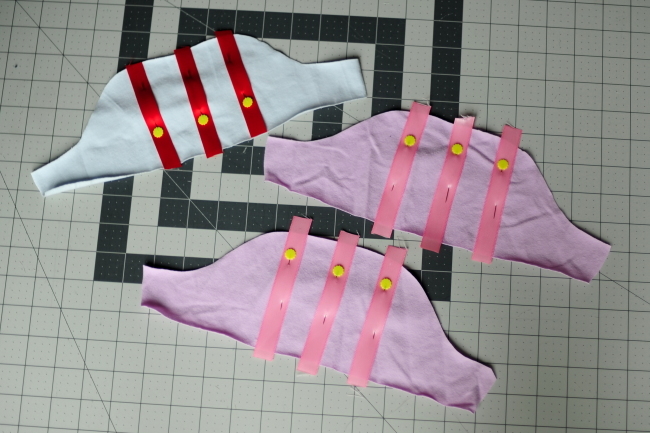 Make sure to heat seal (or use Fray Check) the ends of the long ribbons at the top so they don’t fray! I cut my ribbons for the ties to be about 18″ each, and that was plenty for a nice full bow. Last, I sewed on jumbo ric-rac along the long sides of my lavender center panel to conceal all of the stitching underneath. 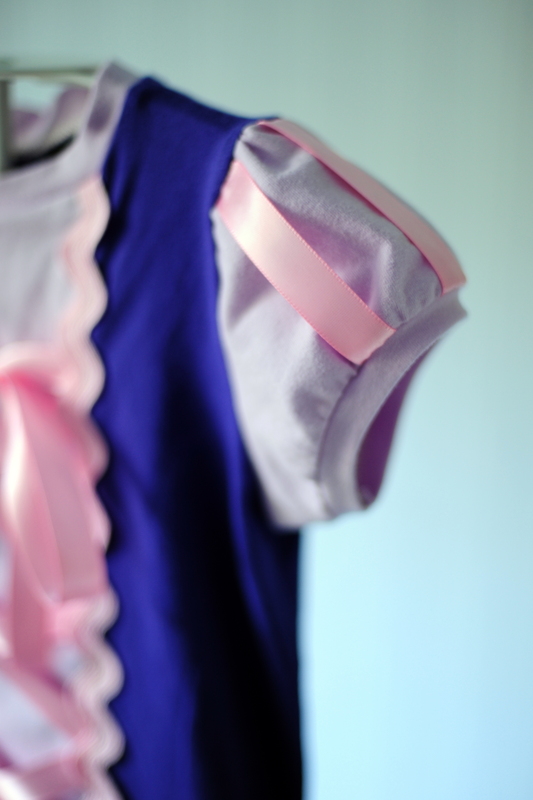 I added my neckband and my bodice was done! For Rapunzel’s skirt, I decided to do a short circle skirt – it’s somewhere between a tunic and a dress, nice and twirly but not so long that she gets tripped up in it. I used a pattern piece that I had from another pattern to draft my circle skirt, but there are a bunch of great tutorials around for calculating the waist circumference to cut a circle skirt. I’ve used this one and this one before; both are great starting points. I used my purple cotton/lycra for the skirt here, and then cut a second skirt from nylon chiffon as an overlay. Nylon chiffon has a nice sheen and doesn’t fray, so it’s a good choice if you don’t want to have to hem it. 🙂 I’ve found it on etsy and also on fabric.com. 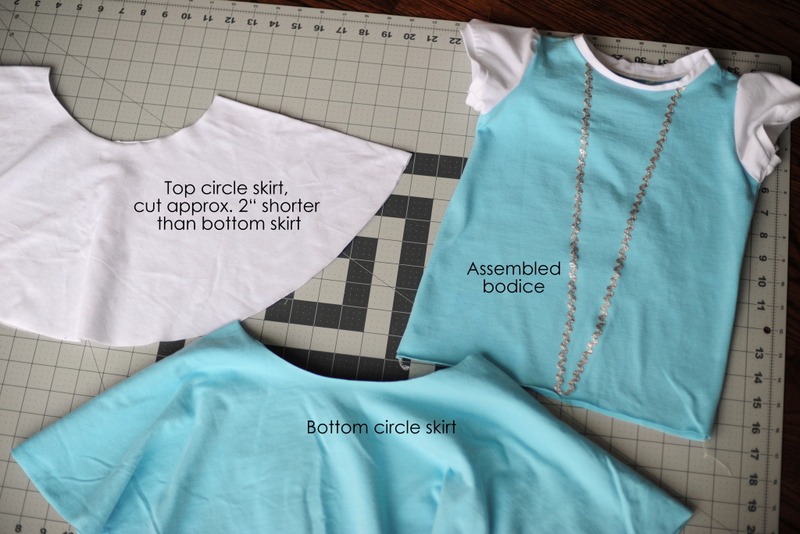 I cut two circle skirts, with the white one being approximately 2 inches shorter to serve as the top layer. I liked the idea of using circle skirts here for maximum twirl factor, but the layered skirts just weren’t looking right to me at first. So I folded the top layer in half, and cut away a small arc from the front, leaving more of the effect of the “official” Cinderella look. 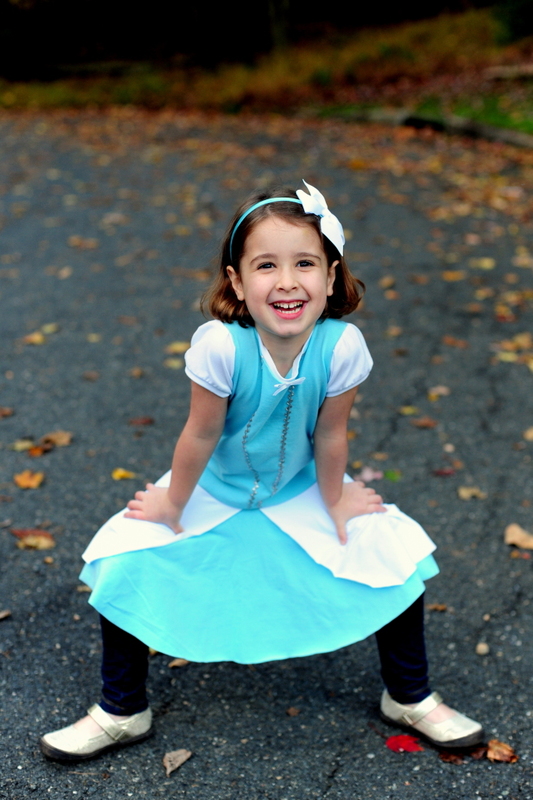 I attached the circle skirts to the bodice, and Miss P was pretty pleased with the final look. You’ll see that I didn’t hem the skirts, since the knit isn’t going to fray, but you certainly could. You could also cut away the same arc at the back of the white skirt as well, but I opted not to since I wanted to keep the back nice and twirly. 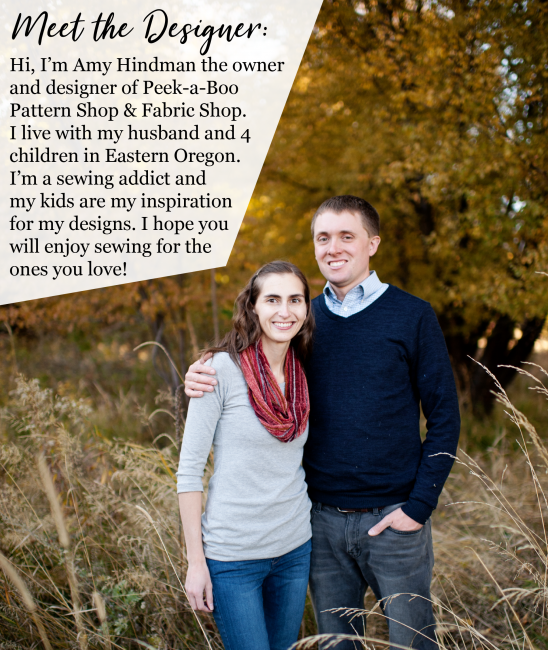 I think these are all brilliant hacks to a simple pattern! Love how each version came out too. 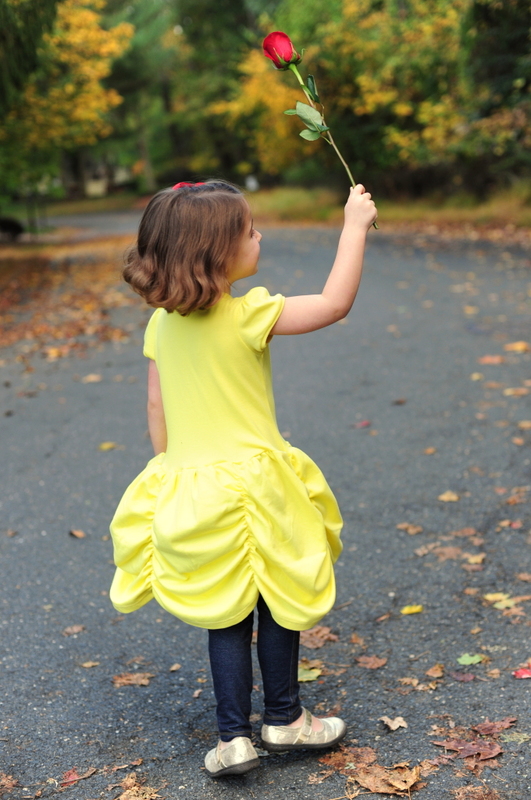 Now I have to find a little girl to make these for!